One day I returned home only to find that our Sony Wega TV (Model KV34HS420) was no longer working. It would respond to the remote control and begin to start to turn on, but then it would make a clicking sound and turn itself off before a picture appeared on the screen. After that, the standby/timer LED would continue blinking 6 or 7 times. This blinking LED is a diagnostic code, but its description of the potential issue provided little value. After reading a few dozen postings on the issue, a pattern began to emerge that made me hopeful that I could repair it myself. We purchased this TV in 2005 while the jury was still out about which flat panel TV technology would eventually replace the tried-and-true CRT technology. Back then, the LCD and plasma flat panel displays still had viewing angle and reliability issues and cost 2 or 3 times as much as an equivalent-sized CRT model and so we just decided to replace our 15-year-old Sony CRT TV with a modern HD-capable CRT TV. I was hoping to get 15 years or more out of this $1500 investment before having to send it to the landfill. After all, this was a SONY, not some no-name brand that I’d expect to fail after only a few years. And tube TVs usually last a very long time. I have one in my basement I purchased in 1985 that is still working fine. This TV has excellent picture quality and no restrictions in viewing angle, and other than its size and weight, I found it much better than what was available with flat panel technologies at the time. Its speakers provide excellent sound quality, much nicer than the tinny sound produced by some of the razor-thin flat panels. It sits in a corner and therefore takes up no more room than an equivalent size flat panel display. So, after only 6 years, I was wondering whether it would need to be replaced or if I could fix it. After a fair amount of forum reading, I found that this 6 or 7 LED blink code was a rather common problem, along with a common solution, namely to replace the MCZ3001DB integrated circuits known as IC8002 and IC6501 on the ‘D’ board. 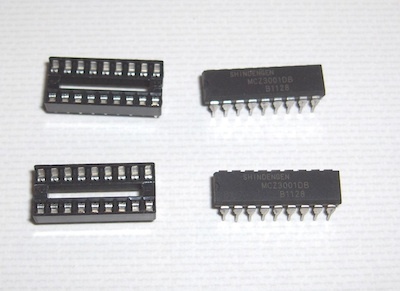 This chip is functionally identical to earlier versions of it known as MCZ3001D or MCZ3001DA. The forums had many people describing their success at making the repair, but pictures of this procedure were non-existent, hence the reason for this blog posting. Also, the level of difficulty and amount of work involved was not clearly described, so I hope to explain and show what I did so the reader can determine whether it is within his or her skill level to attempt this repair. This TV weighs 200 lbs. I didn’t want to have to move it from its stand. Fortunately, it was possible to remove the entire back shell simply by removing all of its screws and sliding it off. There are a lot of screws, about a dozen around the periphery of the TV along with several more on the back panel, but fortunately, it’s a one-person job although it wouldn’t hurt to have a helper because the shell, although fairly lightweight, is bulky. Removing the shell allows access to the ‘D’ board. After removing about a 17 screws, the rear shell can be slipped off. The ‘D’ board is the one shown in the picture below. 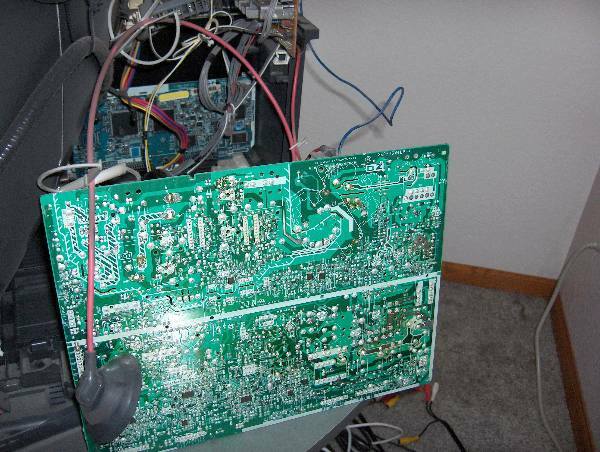 I should mention that before removing the cover, you must unplug the TV and give it a few hours for the high voltages to dissipate so as to avoid shock hazards. It’s best to unplug it and wait overnight, since if the TV is not working so there’s no need for it to remain connected to power. The 'D' board shown above is held in with about 8 screws. It wasn’t clear how to remove the board, or if it would be necessary to undo all of the wiring connections. Some of the connectors were easy to remove, but the 3 high voltage wires that connect to the CRT did not have easy-to-unplug connections. I eventually figured out that I didn’t need to remove those wires at all. There are a number of connectors that need to be flipped upward to disconnect the ‘D’ board from an adjacent board. It wasn’t clear at first how they worked, but if you feel around for a flange you can pull them upward, they’ll unsnap and pivot up 90 degrees like a draw bridge. Two of the connectors had latches on them that require squeezing the lever to unlatch it before they will come out. I unplugged all the other cables I could find, removed about 8 screws, and the board came out far enough to let me rotate it into a position where I could access the bottom of the board. 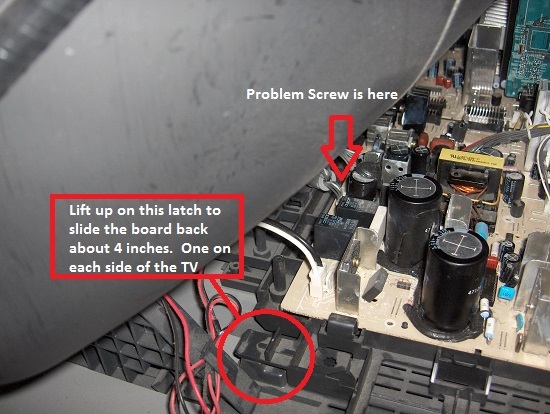 It was necessary to use a stubby screw driver to remove one screw that was far forward, hidden between two connectors, and just under the CRT. To make that easier, you will notice that there are two plastic hooks, one on each side of the tray that the boards are mounted to that you can unlatch which allows all the PC boards to slide back about 4 inches. That makes the front screw easier to access, although you’ll still need that stubby screwdriver. (I’ve since added images of the latch and the board slid back at the end of this article.) After you get all the screws out, the board is still held in by a few plastic clamps on the edge which you can bend back a little to release the board. The board was still tethered by the high voltage connections, but I was able to fix it ‘in place’, by turning it over like shown in the image below. Bottom of Sony 'D' board shown rotated in repair position. Note, it's not necessary to disconnect the wire with the suction-cup-like insulator on it. Unsoldering the two ICs is not difficult if you use a spring loaded solder sucker like the one shown below. Do not waste your time trying to use solder wick or a bulb-type solder sucker for desoldering the chips. Search for YouTube videos with the word ‘desoldering’ if you’ve never desoldered a chip before to see how it works. Also, make sure that the soldering iron is a low-wattage type, and not too hot to avoid lifting the copper traces. 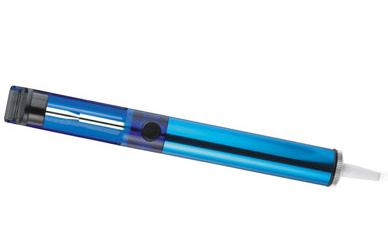 A spring loaded solder pump/sucker like this one works best to remove the solder. 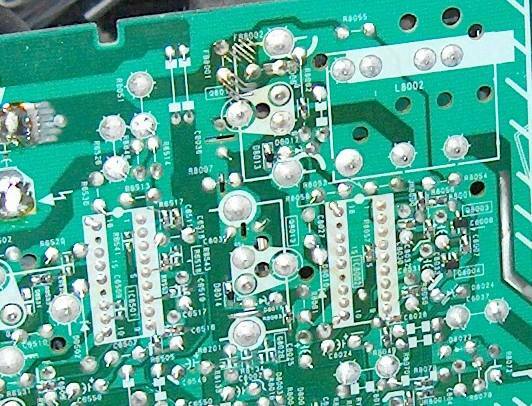 Close up of IC6501 and IC8002 from bottom of board. Note each IC has two unsoldered pins. Do NOT solder pins 13 or 17. If you're using a socket, it would be best to clip the legs in those holes off the socket. 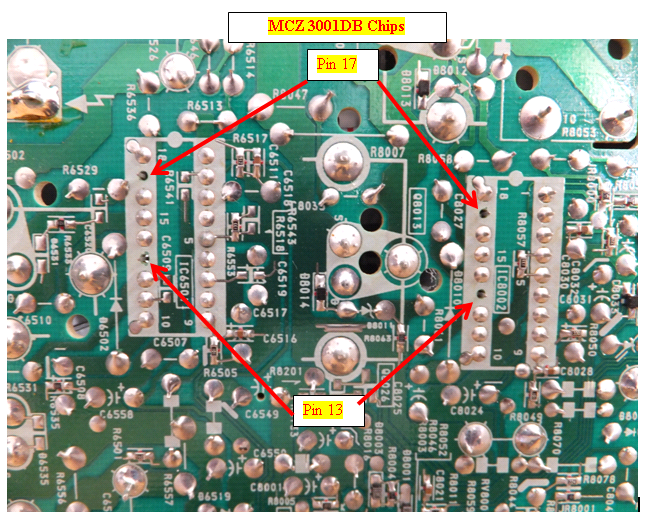 Be aware that each chip has two pins are not soldered to the board. This is normal and so don’t try to solder those pins or the fix will not work. Take note of the orientation of the chips since there is a notch on one end facing the closest edge of the board. You do NOT want to install the chips backwards. Also, don’t solder the new chips in directly to the board. Use sockets in case you ever need to do this repair again, since having to unsolder these chips is most of the work. If they were socketed in the first place, you could replace them without having to solder or even having to remove the D board. After replacing the ICs with sockets, you’ll need to install the replacement ICs. Odds are that only one of the chips is bad, but since you won’t know which one, it’s best to just replace them both. It is necessary to squeeze the pins together to get the legs aligned with the holes in the sockets. This style of IC has its legs spread out by default, and so they won’t automatically align unless you pre-bend them inward just a little to align with the holes in the socket. Carefully examine the chips after you install them to make sure all the legs made it into the socket and that the little half-circle notch at the end of the chip is facing toward the near edge of the board as shown in the photo below. IC8002 and IC6501 installed in their new sockets. After re-installing the board and attaching all the cables, it would be a good idea to test it to make sure the repair worked before reinstalling the cover. If you unlatched the tray and slid the boards back to make access easier, you’ll need to put them back in position or else the remote control and on/off button won’t reach the board. 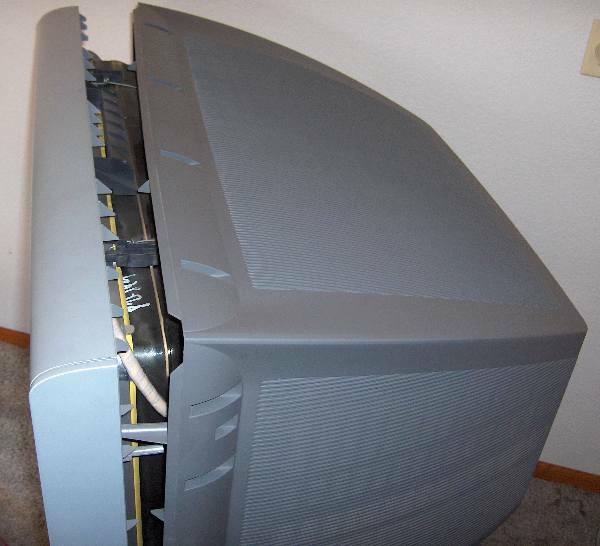 With luck, your TV will be back up and running, avoiding a premature trip to the landfill. 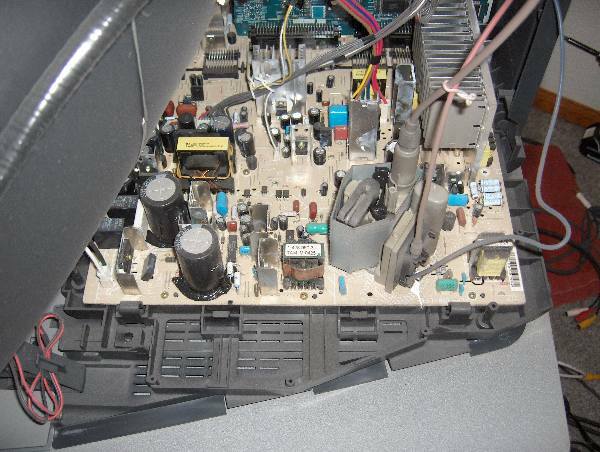 I can’t guarantee this fix will work for you, but the consensus on the forums is that it frequently fixes the 6 or 7 blink code problems on the Sony Wega flat screen CRT models. I found the repair to be of intermediate difficulty, and the result was very gratifying when the TV turned on again. Our TV has now been working like new for more than 2 years, and if it ever happens again, I could fix it more easily thanks to the sockets that are installed. It felt good to resurrect a TV that has great picture and sound quality and, hopefully, a lot of life left in it. The D-board and its carrier have latches on both sides that can be lifted to slide the assembly backward about 4 inches. D-board slid back 4″ into the repair position. 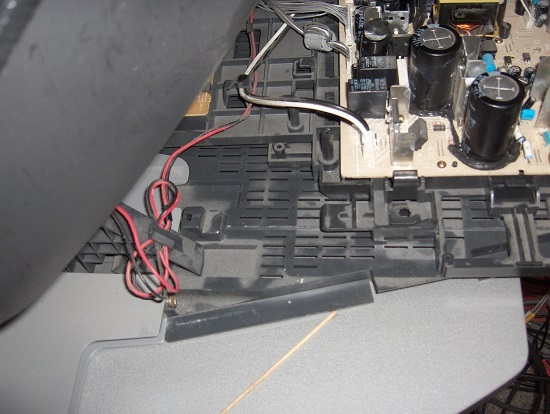 This entry was posted in household repair, how to, technology by Lee Devlin. Bookmark the permalink. Coffee in hand I woke up my Sony KD-34XBR970 Wega only to find it stock still except for the cycling 6 blinks of the LSD on the front. I have been disgusted by the selections out there in the manner of flat-panel TV sets. Right now we moved our Samsung Plasma to make-do until we find a replacement that doesn’t cost an arm & a leg. 6 times 6:0 or 6:1 • +5 line is overloaded. • +5 line is shorted. IC504 is a PQ05RD21 and is available at ebay. 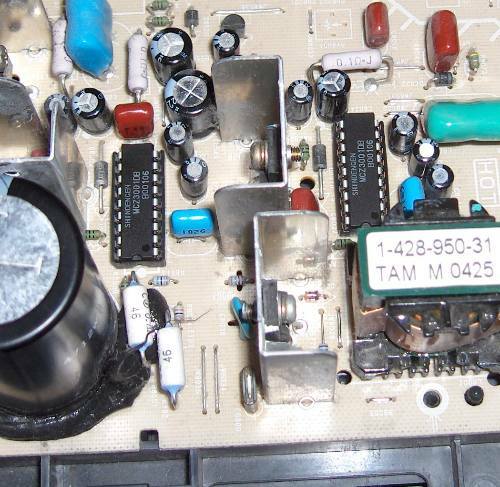 It serves as a 5-volt regulator. I’ve ordered the two IC kits mentioned here and IC504. For less than $40 that these parts are costing me, I’m willing to gamble that I can save this TV. I’m an old Vacuum tube technician who knows how to solder.. no problem there. The garish colors that come through these new flat panel TV sets are beyond annoying. I’d just as soon turn down the colors and go back to B&W! Or read a book! Thanks to Mr. Devlin and to the others who commented most recently. I’ll check back here another time to see if anyone wants additional info out of the service manual. Mine just started doing the 6 blinking light thing a few days ago. So far if I unplug and plug it back in it turns on and is usually fine for the rest of the day. The next day or once about 4 hours later I have to reboot it again. I figure it’s just a matter of time though. Think I’m going to replace it just don’t have the space to store it though. Don’t just my soldering skills which I’ve done very little of to fix it. Yes, it is a shame that this happens to them. They are so heavy and bulky to maneuver. But the images are so much better than what is out there in the newer flat screen digital. I’ve searched for days trying to find something that can come close to imitating the Trinitron Wega images. – and staying under $1,500 for an honest 120 refresh rate and a real-time HDR. My biggest problem was removing the rear black plate. I’m still waiting on my parts to arrive. If you decide not to fix yours and live anywhere along the southern states from Texas to N. Carolina, and want to sell it, please let me know. We will be on a vacation out there this coming April. Excellent article! Thanks for highlighting the experience.It’s nearly 7 years later that I discovered your post but I am glad that it’s still online, especially as these older CRTs now find themselves harder to find but sought after by retro-gamers. CRTs have a special place in many people’s hearts and their unique display characteristics will hopefully continue to capture the imaginations of a select group of people.